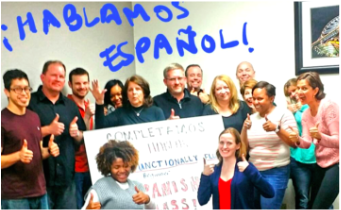 Our Intensive Weekend Spanish Classes held in the Houston Medical Center are one of HABLA's biggest hits! Weekend Spanish Classes are offered every 2-3 months at various levels. We'd love to have you join our current or upcoming Weekend Spanish Classes in the Houston Medical Center. Exact schedules are below. Register Now! A really fun, interactive experience! Learn to DO 50* things in Spanish in one weekend – or your money back! At Intermediate and Advanced, you'll learn to do at least 35 things!